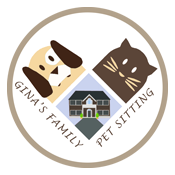 Every week is dog week at Gina’s Family Pet Sitting! However, during this nationally recognized week we encourage you to celebrate in honor of your very best friend. 1. Share your time and a dime by volunteering, donating, or adopting from your local animal shelter. 2. Paw-it-forward to others that you see out with their furries! Share one of your pups favorite treats (our doggy friends love Enar’s Favorite Cookies), go to a pet-friendly restaurant, and play! 3. Spoil your pet with a special trip to a local pet bakery, pet store, or dog park for a treat, game of frisbee, or whatever is fun for your pup! 4. LAST BUT NOT LEAST … PLAY, PLAY, PLAY! It’s been scientifically proven that petting, playing, and interacting with your pet has many health benefits for us hoomans too. And of course, our dogs LOVE IT because they love YOU.